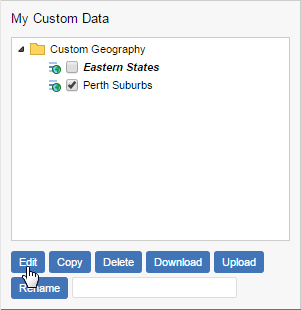 In the My Custom Data section, select the check box next to the group you want to edit. SuperWEB2 adds the contents of your group to the list on the right. When you have finished making changes, click Save to save your changes. Click Cancel Edit to stop editing the group without saving any of your changes. If you edit a group that is currently in use in the table, then the old version of the group will continue to display in the table. To update to the new version you must add it to the table again.